This essay is based on the attached working paper. A quarter of a century since Chilean-style pension reforms swept Latin America, the state of the region’s pension systems is worrisome. Old and new problems are rearing their ugly heads, some setting off serious alarms, all posing thorny political and technical challenges. Pension issues have therefore once again taken center stage in the policy debate. The landscape of pension systems in the region is diverse. “Contributory” pensions (financed by workers and employers’ contributions) are at the core, but “non-contributory” pension programs (financed by general tax revenues) have mushroomed in parallel in recent years. There are two basic types of contributory systems: pay-as-you-go defined-benefit (PAYG-DB) and fully-funded defined-contribution (FF-DC). In a PAYG-DB system, contributions by active workers fund the pensions of current retirees, in accordance with parameters such as retirement age, number of years of service, and pre-retirement average wages. By contrast, in a FF-DC system, contributions are channeled to individual accounts and invested by pension fund management companies; at retirement, the accumulated savings in those accounts are transformed into a stream of monthly income, for example, through annuity products offered by life insurance companies. As shown in Figure 1, three of the largest countries in the region (Argentina, Brazil, and Venezuela) feature a dominant PAYG-DB system. (PAYG-DB systems also feature in many of the small countries in the Caribbean and Central America.) FF-DB schemes are the only game in town in four countries (Bolivia, Chile, Dominican Republic, and El Salvador). 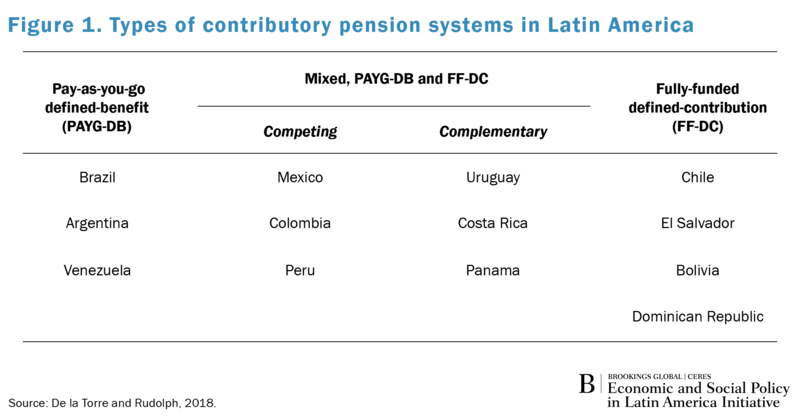 PAYG-DB and FF-DB schemes co-exist in six countries, either competing among themselves for formal workers (as is the case in Colombia, Mexico, and Peru) or complementing each other (as occurs in Costa Rica, Panama, and Uruguay). Non-contributory “social” pensions now exist in at least 14 countries in the region. Consider first PAYG-DB systems. Many of them pose a major threat to fiscal sustainability, reflecting their proneness to fall into a time inconsistency trap, as myopic governments expand pension promises without expanding contributions, thus widening the actuarial deficit of the system and leaving future governments holding the bag. This serious problem tends to be downplayed, especially where the actuarial deficit does not yet materialize into cash claims on the budget (that is, where contributions from active workers are still sufficient to pay for the pensions of retirees). As time goes by and populations age, however, overcommitted PAYG-DB systems inevitably run into cash flow deficits—a perverse dynamic that is exacerbated by the fact that Latin America is currently aging much faster than rich nations did in the past. In several countries, the fiscal sustainability challenge is aggravated by deep inequities typically arising from significant differences in benefits (or degrees of subsidization) across PAYG-DB subsystems focused on specific groups (e.g., the military, civil servants, subcategories of civil servants, etc.). Brazil’s pension system illustrates well the type of fiscal time bomb and inequities that tend to ail PAYG-DB systems. 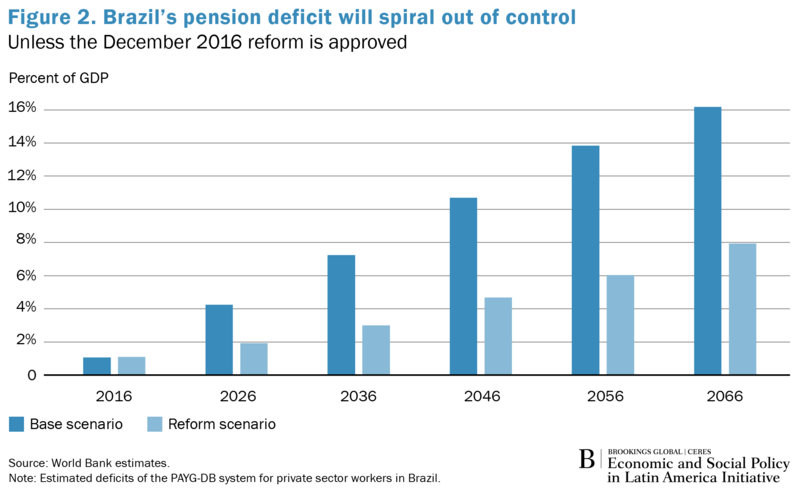 As shown in Figure 2, Brazil’s pension deficit will spiral out of control unless the reform proposed in December 2016 is approved (the present value of pre-reform future pension deficits associated with pensions to private sector retirees is about 150 percent of today’s GDP). Though the proposed reform would reduce deficits, it would not rein them in fully. Post-reform deficits are still projected to rise over time, largely reflecting a fast rate of population aging. As regards inequity, the Brazilian PAYG-DB subsystem for federal civil servants is so generous that its deficit is about 50 percent that of the PAYG-DB subsystem for private sector workers, even though the former only covers 3.5 percent of the number of beneficiaries of the latter. Similar threats to fiscal viability and inequities are present in other PAYG-DB systems, especially in countries where highly subsidized PAYG-DB systems compete with FF-DC schemes. As a result, workers systematically move from the FF-DC to the more generous PAYG-DB system before retiring. This is the case of Colombia and Mexico, where the actuarial deficit of the PAYG-DB pillar is estimated at 130 and 80 percent of current GDP, respectively. Consider now the challenges faced by FF-DC systems. To be sure, they have managed to accumulate large amounts of investable funds—pension fund assets are approximately $450 billion, or about 26 percent of the combined GDP of the countries where FF-DC systems exist. For all their merits, however, their performance has fallen short of expectations in at least two significant respects. First, FF-DC systems have not led to the expansion in coverage that early reformers envisioned. Second, they are increasingly failing to deliver “adequate” pensions from a consumption smoothing perspective. The main cause for inadequate pensions under FF-DC systems has been the combination of low mandatory contribution rates, significant time gaps in contributions throughout the work life, and relatively low retirement ages. Inadequate pension generation by FF-DC systems is also due to certain wedges—between the incentives of principals and agents, between the interests of individuals and the collective, and between shorter- and longer-term investment horizons—which are inherent to the very nature and industrial organization of FF-DC systems. Though their quantitative impact is smaller, these wedges are a source of political and social irritation that undermines the legitimacy and sustainability of FF-DC systems. An additional and most relevant problem of FF-DC systems is that, except for the case of Chile, the savings accumulation phase (while the worker is active) is not appropriately complemented by a well-functioning payout phase (the generation of a stable income stream during retirement) due to underdeveloped annuities markets and poorly-designed phased withdrawal schemes. Finally, consider the issues raised by non-contributory “social” pensions. Their emergence reflects a widespread policy drive toward mitigating poverty in old age and is a direct response to the low coverage of contributory pensions (which cover, on average, only an estimated 30 percent of the labor force in the region, with less than 60 percent of those covered either not eligible for a pension under the PAYG-DB system or unable to fund an adequate pension with their savings under the FF-DC system). The root cause of low coverage is, of course, high informality—an informal worker is typically defined as one that does no contribute to the social security system. While most of the existing non-contributory “social” pensions schemes are not well integrated into the core pension systems, they are well targeted, provide a modest benefit, entail a low fiscal cost (below 0.5 percent of GDP per year), and do not significantly discourage workers from leaving informality. However, political dynamics may well put pressure to expand their benefits and lead to a slippery slope that can raise fiscal costs in the future, as illustrated by recent developments in Ecuador and Mexico. Moreover, fiscal costs are already non-trivial in Argentina and Brazil—2.5 and 2 percent of GDP per year, respectively—reflecting their broad coverage—they reach 90 percent of the elderly population—and generous pension benefits that make these “social” pension systems more likely to encourage workers to remain informal. The mentioned challenges call for reforms that, while difficult to implement politically, are necessary to prevent unwise reform reversals and/or pensions crises down the line. The key areas for reform can be readily identified. First, parametric changes (e.g., raising the minimum age to qualify for retirement, lowering the pension benefit) are needed to make PAYG-DB systems fiscally viable. Given the fast rate of population aging in the region, future pension benefits under PAYG-DC schemes will have to be less generous than today’s. Therefore, the saving component of pensions must inevitably be strengthened by improving the performance of (complementary) FF-DC pillars. This requires promoting and raising saving for old age (even among informal workers), better aligning the interests of pension fund managers and savers, extending investment horizons, automatically adapting portfolio compositions to the worker’s age, and fostering the development of sound annuities markets. Finally, anti-poverty “social” pensions will have to be better integrated into core pensions systems and made more effective, while at the same time keeping their fiscal costs in check and minimizing their potentially distortionary effects on labor markets.